AP Furnishing of Information of all Bank Accounts of various agencies/Government Departments Uploading the same in CFMS Portal as per G.o.No:112/Furnishing of Information of all Bank Accounts of various agencies/Government Departments Uploading the same in CFMS Portal all Bank Accounts or keeping public money in accounts other than those uploaded in CFMS portal by 03.08.2018. 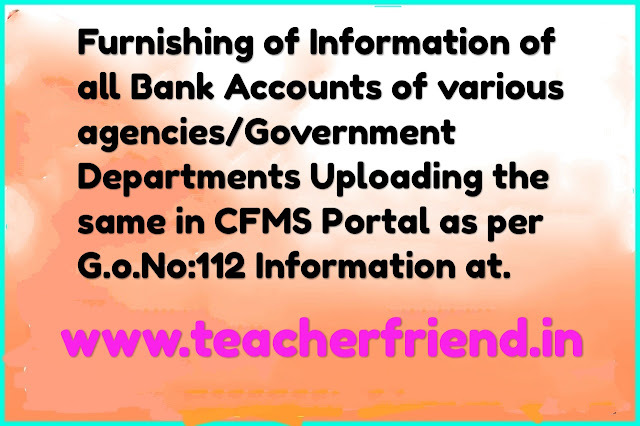 Government Departments – Uploading the same in CFMS Portal Instructions Issued as per G.O.MS.No. 112 Dated: 24-07-2018. Account Information in cfms.gov.in. The amounts relating to the earnings/profits/ Endowed funds/deposits for pensions and gratuity /all monies operated by the institutions must be entered in the database. After uploading the information in CFMS portal, the DDOs/Accounts Officers of all Departments/Institutions /Corporations shall have to certify that they are not maintaining any accounts other than those which are Uploaded in CFMS portal. The Heads of Departments concerned must ensure that the information uploaded is correct and updated and a confirmation has to be given in CFMS by 03.08.2018.
government accounts and all the Government Officials shall ensurereleasing Government Funds to these notified accounts only. A.P.C.S. (CCA) Rules, 1991 which can even lead to dismissal from service.